The well known view of the Caribbean Sea as seen from El Castillo temple at the Mayan ruin site of Tulum is located just 18 miles to the south of Akumal. Comparatively small to such sites as Chichen itza and Coba, this archeological site can be toured in just a few hours to a full day, depending on the interest of the visitor. In addition to the famous Temple of the Frescoes and the Temple of the Descending God, Tulum offers visitors a spectacular beach, which sits beneath its 40’ cliff. Next to the parking area for the ruins, Tulum offers visitors an enormous market for souvenir shopping. Just a few miles to the south in Tulum Village, there is also shopping as well as some delightful, local eateries, serving everything from fresh seafood, pastas, and home made pizzas to authentic Mayan and traditional Mexican dishes. The village of Tulum also makes for a delightful evening outing for dining as well as shopping. Most restaurants begin filling with locals late in the evening, from about 9:00 PM until 11:00 PM. Exit Akumal and turn left (south) onto Highway 307. Continue south for approximately 18 miles. Before reaching the village of Tulum, there is a large parking area on the left which is well marked with signs. This is the parking area for Tulum ruins. From the parking area, signs will guide you to the ruins site. 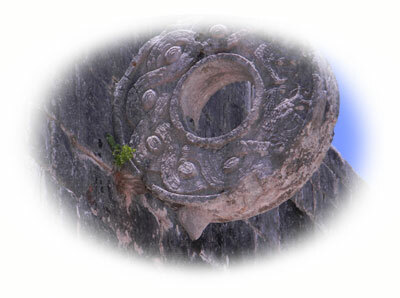 If going to Tulum Village for shopping or dining, continue straight, past the parking area for the ruins. Highway 307 will lead directly into the village and will turn into the main boulevard, with parking and establishments on either side. Often bypassed by tourists, the archaeological site of Xel-Ha is small, but was a significant coastal Mayan community when occupied. Nestled in the jungle just passed the large Eco-Park of Xel-Ha and on the opposite side of the highway, this small site was originally named for “Ixchel” and was once an important maritime port, serving as the starting point for frequent Mayan pilgrimages to the island of Cozumel, accessible only by canoe. The ruins themselves stretch through an expanse of jungle among a variety of flora, interspersed with abundant Ceiba trees. This tree, easily identified by its thorny bark, was considered sacred in Mayan culture as the tree of life; it’s sprawling surface roots representing our connection to the underworld and wide-reaching branches signifying our connection to the world of god and space above. The original sacbe (Mayan road) is a beautiful walk which still stretches from within the ruins out towards the first of two beautiful cenotes. 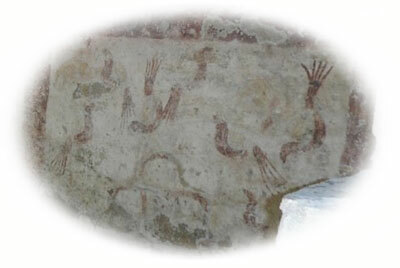 Along side of this first cenote lies a small cluster of structures, highlighted by the painting of a descending jaguar. 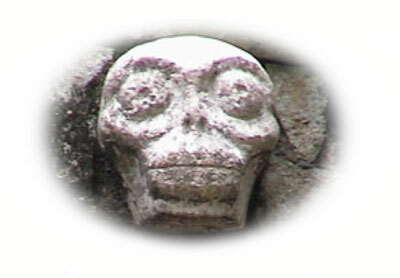 This figure represents the descending god of the underworld, or Xibalba, linked by Mayans to cenotes and oceans. 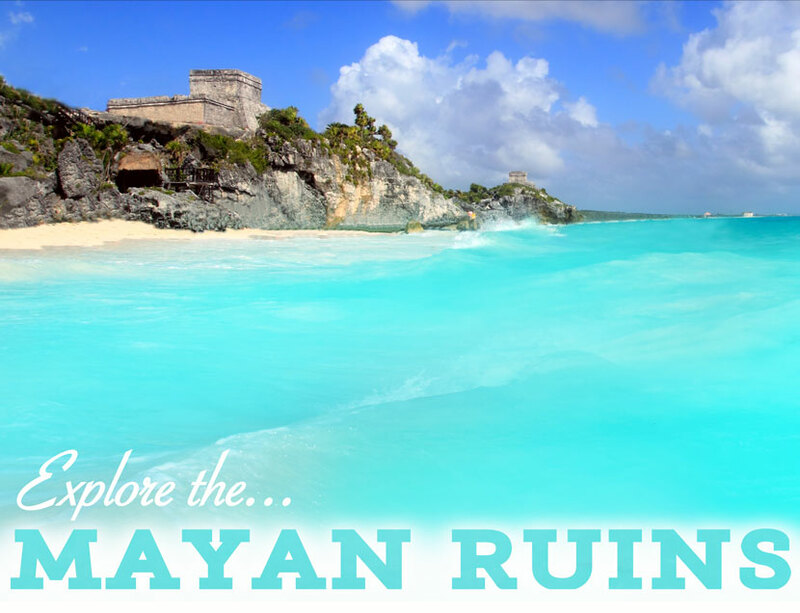 The real magic of the ruins Xel-Ha, though, lies in their seclusion; here you will often find yourself the only visitor, and feel as if you have discovered a treasure of the ancient world. Wander the shady paths and watch for large iguanas basking in the sun or skittering along the ground; look towards the trees for an abundance of birds, which populate the area. Be sure to treat yourself to a cooling dip in one of the freshwater cenotes, and lose yourself in the beauty of the jungle! Exit Akumal and turn left (south) onto Highway 307. Continue south for approximately 10 KM / 6 miles. As you approach the large Eco-park entrance at Xel-Ha which is on the left, keep an eye on the right (jungle side) of the highway until you see some of the ruin structures and then an entrance road. Turn right at the entrance and it will lead to the parking area for the ruin site. For those visitors that have rented a car and are seeking a full day of adventure, but one that is a bit more cultural and authentic than some of the larger Eco-parks, the vast and still largely unexcavated ancient Mayan city of Cobá is the perfect choice. Just under an hours drive from Akumal, most of the ruins at Cobá are still buried in the jungle and unlike Chichen-Itza, are still in their natural state. Also, unlike Chichen-Itza, visitors that are so inclined can still climb the large pyramids that tower over the jungle’s canopy. While there are countless small, narrow trails through the jungle to many areas of the Cobá site, there are wide, well marked trails leading to the more significant and larger structures. With bikes available for rent at the entrance, visitors can explore the main areas within a few hours while those that prefer the walk can visit the main areas more leisurely, in 3 to 5 hours, depending on time spent at each temple. In addition to the ruin site itself, the village of Cobá and the open air market just outside the entrance to the ruins, offer a wide variety of goods; from authentic Mayan woven hammocks and souvenirs, to jewelry crafted in silver by local artisans. Also in the village are several local restaurants serving authentic dishes of the Maya. Another great spot for lunch is the restaurant within the courtyard of the Villas Arqueologicas Coba Hotel, which sits next to the lake, just outside of the village. When heading for a day at Cobá, be sure to wear comfortable walking shoes and bring sunscreen, repellent, as well as a hat to help prevent sunburn. For those that have been to Tulum, Cobá offers visitors an enormous contrast to the much smaller, coastal ruin site and a look into the land of the Maya that one will never forget. Cobá was estimated to have had some 50,000 inhabitants (and possibly significantly more) at its peak of civilization, and the built up area extends over some 80 km². The site was occupied by a sizable agricultural population by the 1st century. The bulk of Coba’s major construction seems to have been made in the middle and late Classic period, about 500 to 900 AD, with most of the dated hieroglyphic inscriptions from the 7th century (see Mesoamerican Long Count calendar). However, Cobá remained an important site in the Post-Classic era and new temples were built and old ones kept in repair until at least the 14th century, possibly as late as the arrival of the Spanish. 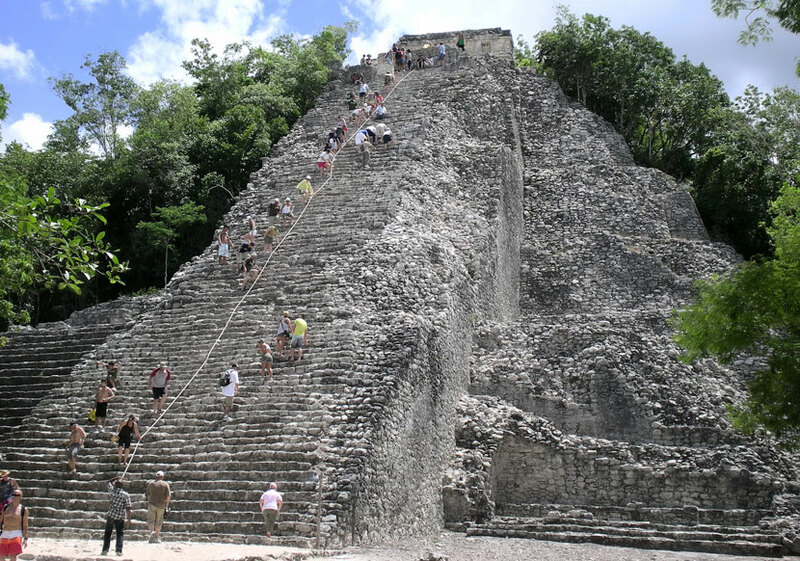 Archaeological evidence indicates that Cobá was first settled between 50 BC and 100 AD. At that time, there was a town with buildings of wood and palm fronts and flat platforms. The only archaeological evidence of the time are fragments of pottery. After 100 AD, the area around Cobá evidenced strong population growth, and with it an increase in its social and political status among Maya city states which would ultimately make Cobá one of the biggest and most powerful city states in the northern Yucatán area. Between 200 and 600 AD, Coba must have dominated a vast area, including the north of the state of Quintana Roo and areas in the east of the state of Yucatán. This power resided in its control of large swaths of farmland, control over trading routes, and—critically for a Mayan city—control over ample water resources. Among the trading routes, Cobá probably controlled ports like Xel Há. Directions from Akumal to Cobá Ruins: Exit Akumal and turn left (south) onto Highway 307. Continue south for approximately 18 miles. Before entering the village of Tulum, turn right onto the Cobá Highway (there is a sign with an arrow). Continue on the Cobá Highway for 26.1 miles where you will reach a three-way fork in the road. Turn left and then continue through the village of Cobá. When you reach the lake turn left and there will be a large parking area for the ruin site. 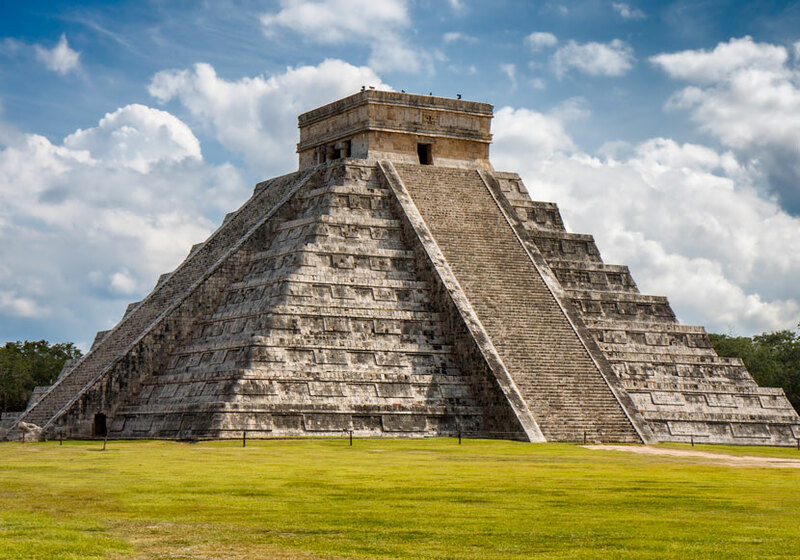 As seen in the photo above, the El Castillo at Chichen-Itza, also known as the Temple of Kukulcan, is recognized around the world as a symbol of the ancient Mayan culture as well as one of wonder and mystique. For visitors to Akumal that have never been, a trip to Chichen-Itza is something that one remembers for their entire life and although not as close as some of the other Mayan sites, is within a days trip. If time permits, an overnight stay is best in order to take it all in and if not, a early start from Akumal and returning that night, can be done. For those visitors that have a rental car, the trip to Chichen-Itza makes for a fun and memorable excursion. 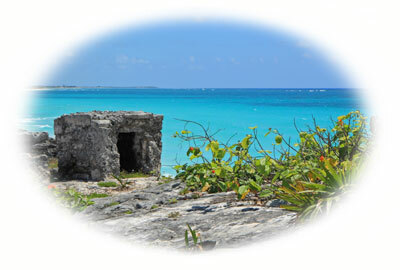 For those that haven’t rented a car, private tours are available out of Akumal and group tours from Playa Del Carmen. If time doesn’t permit a trip to Chichen-Itza, the Mayan ruins at Coba are within a one hour drive of Akumal and there are several pyramids which are equally as tall as the El Castillo at Chichen-Itza and, although not as famous or as large at the base of their structure, are a marvel of achievement and a climb that one will never forget. Directions from Akumal to Chichen-Itza Ruins: Exit Akumal and turn left (south ) onto Highway 307. Continue south for approximately 18 miles. Before entering the village of Tulum, turn right onto the Coba Highway (there is a sign with an arrow). Continue on the Coba Highway for 26.1 miles where you will reach a three-way fork in the road. At this point, be sure to take the MIDDLE fork in the road and proceed on this road until it ends at a “T” intersection, and then turn left. Once you have made this left hand turn, proceed until you reach the town square at Valladolid. For lunch, the restaurant in the colonial style hotel, on the opposite side of the town square as the cathedral, serves delicious, authentic Mayan dishes as well as other cuisines. From the town square at Valladolid, follow the signs to the “Autopiste”, which is the toll road, and once at the toll road take the entrance ramp with the signs leading to Merida. 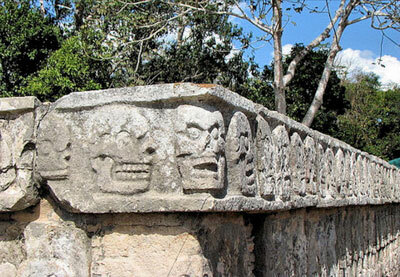 Proceed on the toll road until you reach the exit for Chichen-Itza and exit to your right. Once you have exited, follow the signs to the ruin site itself. The drive time from Akumal to Chichen-Itza is approximately 4 hours. In addition to those listed above, the Riviera Maya and the Yucatan are home to countless more ancient Mayan archaeological sites. One worth noting on the coast is “Muyil”. 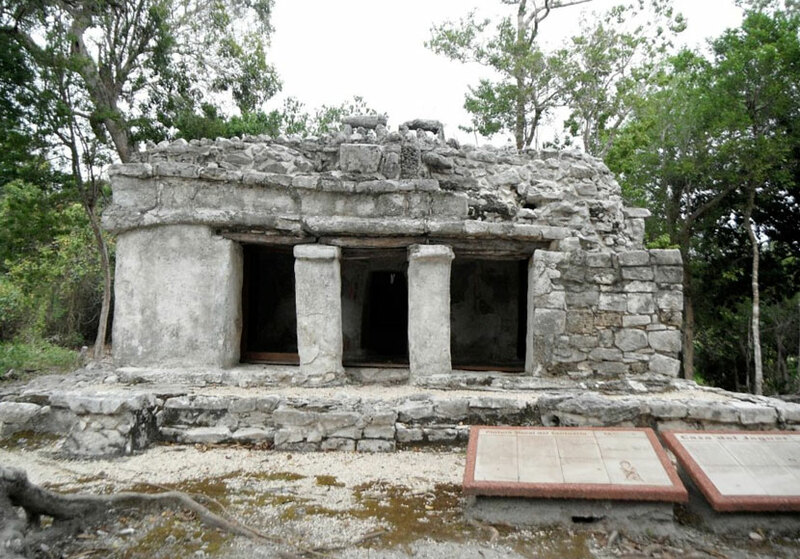 Located south of Tulum Village, on the left hand side of Highway 307, this site is still largely buried in the jungle and well worth the visit. In the interior, several sites that are a must for Mayan enthusiasts are the ruins of Uxmal and the more recently discovered Ek-Balam. If interested in visiting these site, directions and historical information are available online.